Chris “Mac Daddy” Kelly of the ’90s rap duo Kriss Kross has died, The Associated Press reports. Investigator Betty Honey of the Fulton County Medical Examiner’s office said the 34-year-old was pronounced dead around 5 p.m. Wednesday at an Atlanta hospital. There has been no word on cause of death. Kriss Kross became popular with their 1992 smash hit “Jump” and for wearing their clothing backwards. Kelly, along with Chris “Daddy Mac” Smith were reportedly planning to reunite this year. 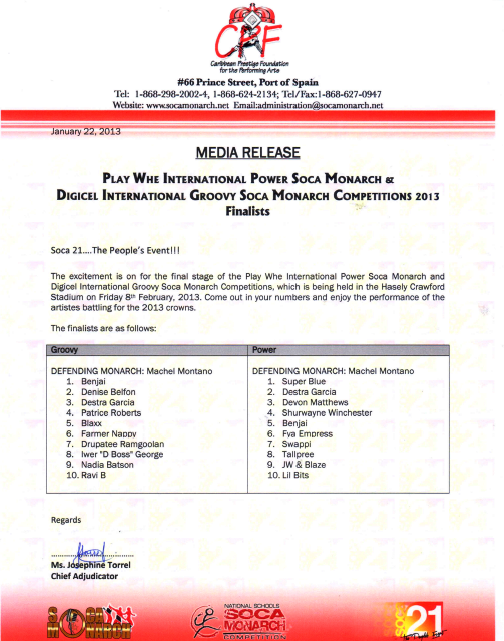 Digicel International Groovy Soca Monarch Competitions, which is being held in the Hasely Crawford Stadium on Friday 8th February, 2013. 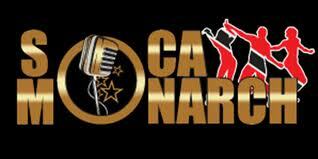 Come out in your numbers and enjoy the performance of the artistes battling for the 2013 crowns. Bunji Garlin and Fay Ann Lyons-Alvarez have both bowed out of the International Groovy and Power Soca Monarch competitions, respectively. As it with any contract that we are positioned to get into be it endorsement, real estate or the likes we sat with management and legal team for proper advice about the Soca Monarch contract simply because it is our right and responsibility as human beings and artistes to do so. To enter into Soca monarch one has to agree and therefore sign the contract and we are not in agreement with some of the contracts clauses and we are in no way asking nor demanding that they make changes to suit us because it would not be fair to the other artistes therefore we choose to respectfully withdraw from the competition. This is not expected to be a noisy situation or a back and forth public battle, the Foundation reserves it’s right to do what it thinks is needed to protect it’s entity just as we reserve the right to agree , disagree and protect ourselves where and when is required. The couple announced this last night, saying they decided to withdraw because they believe that fundamental clauses in the competitors’ contracts were objectionable and demanded too much of the winners. They were therefore advised by their management and legal representatives that it was best they pull out of the competition before the semi-final round on Sunday at the Arima Velodrome. Bunji had pulled position number 15 and Lyons-Alvarez number 20. Among the elements in the contract with which Bunji and Lyons-Alvarez took exception to was the rule that winners must give back to the Caribbean Prestige Foundation (CPF) five per cent of the winnings. Also, the winners must defend the respective titles the following year, or they will have to pay back 90 per cent of the prize money. Another clause the artistes are objecting to in the contract is that the winners must attend the prize distribution ceremony wherever it may be, here at home or abroad. Chairman of CPF William Munro, said last night he was saddened and very hurt over Lyons-Alvarez and Bunji pulling out only two days before the semi-finals, and he was hoping they would reconsider. “Fay Ann topped the Power in the preliminaries and Bunji topped in the Groovy. I am wondering how the public is going to take this news because everybody was so happy when they returned. “I hope they will reconsider or at least meet with me. I have no malice and still love them. I will bend over backwards for them, but I can’t change the rules to please only two people,” Munro said. Lyons-Alvarez and Bunji did not compete in the Soca Monarch competition last year and at that time announced they were considering not returning because they wanted to focus on taking their music directly to an international audience. When Bunji ended up with a major hit with the release of the song “Differentology” in November last year, people began to call for his return to the competition. This was the same with Lyons-Alvarez when she released, among other songs, “D Stage Open”. After several weeks of saying they will consider returning to the Soca Monarch if that was what the people wanted, the couple’s management registered them to compete, with Bunji in the Groovy and Lyons-Alvarez in the Power Soca Monarch. Adding to the excitement of their return was the fact that Lyons’ father, five-time Soca Monarch champion SuperBlue, had also made a comeback after an over-decade-long hiatus. 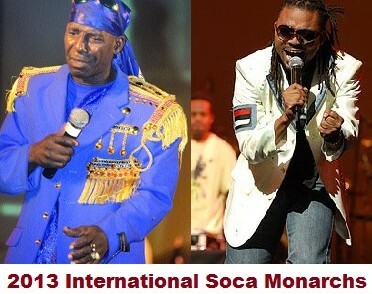 All soca music fans and the public at large were anticipating a grand showdown at the Hasely Crawford National Stadium on Carnival Friday between Lyons-Alvarez, SuperBlue, Iwer George and defending Power Soca champion Machel Montano, as well as the clash between Bunji and Montano in the Groovy category.